We occasionally run across a few customers that require the installation of an overhead paging system. 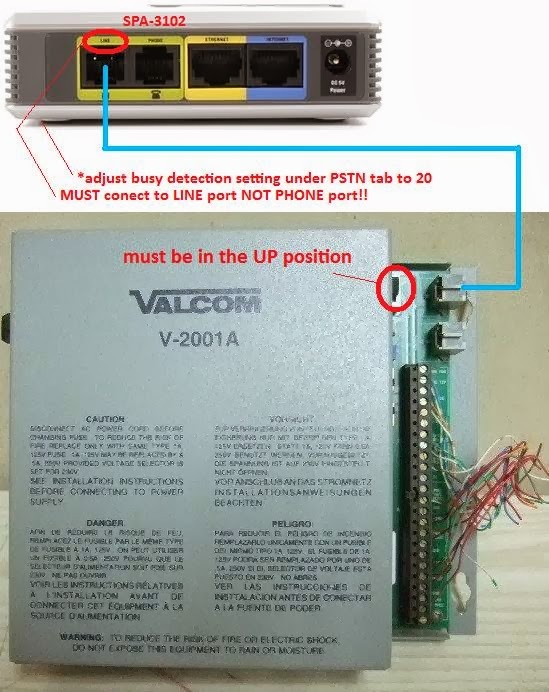 While we generally install Bogen UTI-1 devices for single zone paging applications, and UTI-312 devices for multi-zone paging applications we have come across several customers who have Valcom V-2001A devices already installed at their location. These Devices are different in the Bogen devices in that while the Bogen device will work with an FXS device, the Valcom will not. The Valcom requires an FXO port. Programming the 3102 to work with your VoIP service is beyond the scope of this article. Check with your VoIP provider, or the documentation for the IPPBX system that you are using for configuration of the device to work with your service. 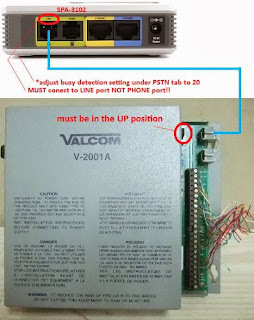 Once the device is programmed properly, a simple test that can be performed to confirm that it is properly provisioned is to connect the LINE side of the device to a dial tone, then call into your 3102 - you should get the dial tone that the device is connected to, to confirm this disconnect the line cord from the line side of the device while you are on the call. You should immediately lose the dial tone. Connecting a SPA3102 with the default settings will NOT work. You need to adjust the Busy detection setting under the PSTN tab. By default this is set to 30. I have found that by changing this setting to 20 everything will work properly. If you do not adjust this setting, the device will never connect to the device. Before connecting the LINE side of the SPA 3102 to the V-2001a you should make sure that the switch next to the top jack that you will be connecting to is in the up position.